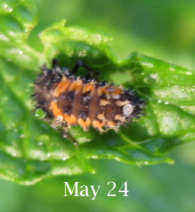 The photographs here show the life of Lady Beetles - Coleoptera: Coccinellidae. If you see any of the bugs that are pictured above and below in your trees, bushes, or plants, please do not kill them. Ladybugs are good bugs. They eat aphids. 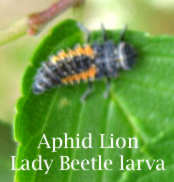 The first picture is the ladybug larva. It is an odd-looking thing, but do not kill it! After a while, I don't know how long, the aphid lion will start entering into the pupa stage. 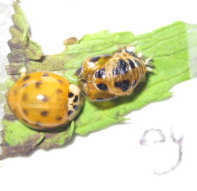 Don't let these creep you out, they are going to become The Lady Beetles some day. The next day I checked on the pupa again. 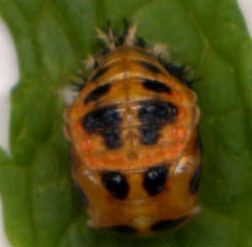 The pupa is exposed, right on top of a mint leaf. I broke off the leaf and brought it into the house. I didn't do this to protect it; I wanted to see it emerge and possibly record the event. I set up a card the way I usually do and taped the leaf to it. The pupa did nothing the rest of the day or the next day. Meanwhile, I placed the pupa in a protected area so nothing would hurt it. On the morning of May 30th, it emerged but I did not see it. I took a picture of the ladybug after emerging and a then another picture a little while later. After a little bit, I took the ladybug outside and placed it on a tomato leaf that had several aphids on it. 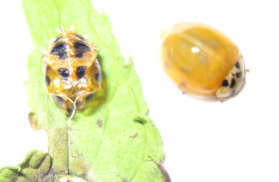 The small gray spots are aphids and the larger red bug is an aphid. The beetle walked onto the leaf and stopped with its back to the aphids. 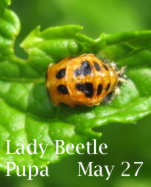 About an hour later, I checked on the lady beetle and took the photograph below. The ladybug had turned around and was eating the aphids. Later that evening, I looked under the same leaf and found no aphids and no beetle. I suppose it ate all of the aphids and moved on. That is what Lady Beetles do. 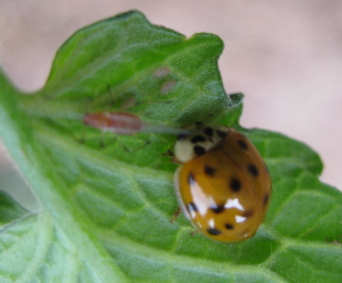 Lady beetles over winter as adults and lay eggs in the spring. They are fond of over wintering in my mint patch and that is a safe place for them since the mint patch is almost never disturbed. The 3-page attendance calendar for one student that matches the colonial planner. A Half-Sized Menu - these files are available in both printing settings of regular and booklet printing. See page for details. Butterfly Video - Assisting a Monarch butterfly after emerging. The videos have been broken for a while, and now they are working.